Harvard computer scientists have demonstrated how a self-organizing swarm of 1,024 small robots can collaborate to enact complex behaviors. According to lead developer Radhika Nagpal, the small, simple robots (named “Kilobots”) represent a significant milestone in the development of collective artificial intelligence. 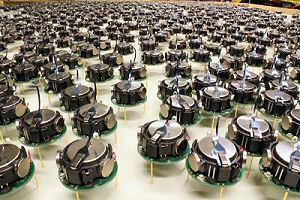 The three-legged Kilobots and their swarming behaviors are detailed in the latest issue ofScience. Co-researcher Michael Rubenstein says the team kept the cost of the Kilobots as low as possible. 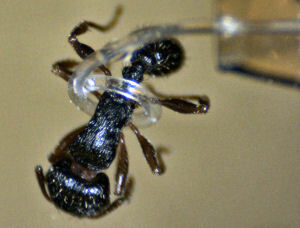 Each robot moves using two vibrating motors that allow it to slide across a surface on its rigid legs. An infrared transmitter and receiver allow it to communicate with a few of its neighbors and measure their proximity – but the robots are myopic and have no access to a bird’s-eye view. “These robots are much simpler than many conventional robots, and as a result, their abilities are more variable and less reliable,” Rubenstein says. “For example, the Kilobots have trouble moving in a straight line, and the accuracy of distance sensing can vary from robot to robot.” But the Kilobots correct their own mistakes. If a traffic jam forms or a robot moves off-course – errors that become much more common in a large group – nearby robots sense the problem and cooperate to fix it. 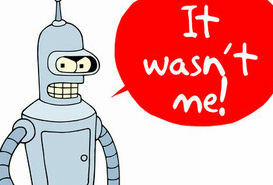 Notably, the Kilobots require no management or intervention once an initial set of instructions has been issued. Four robots mark the origin of a coordinate system, all the other robots receive a 2D image that they should mimic, and then using very primitive behaviors – following the edge of a group, tracking a distance from the origin, and maintaining a sense of relative location – they take turns moving towards an acceptable position.